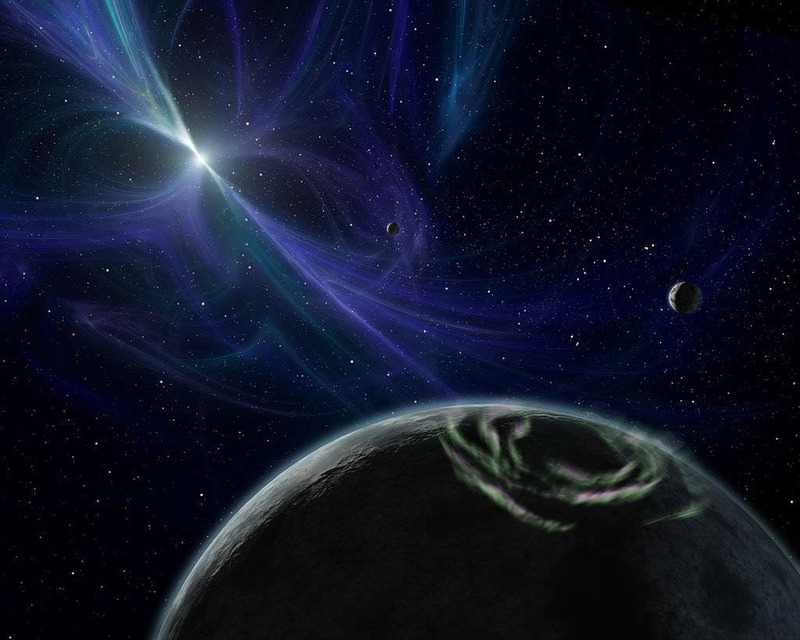 It is theoretically possible that habitable planets exist around pulsars. Such planets must have an enormous atmosphere that convert the deadly X-rays and high energy particles of the pulsar into heat. This is the conclusion of a paper by astronomers Alessandro Patruno and Mihkel Kama, working in the Netherlands and the United Kingdom. The paper appears today in the journal Astronomy & Astrophysics. The NASA/JPL image above is an rrtist's impression of the planets orbiting PSR B1257+12. The astronomers studied the pulsar PSR B1257+12 about 2300 light-years away in the constellation Virgo. They used the Chandra Space Telescope, which is specially made to observe X-rays. Three planets orbit the pulsar. Two of them are super-Earths with a mass of four to five times the Earth. The planets orbit close enough around the pulsar to warm up. Patruno says, "According to our calculations, the temperature of the planets might be suitable for the presence of liquid water on their surface. Though we don't know yet if the two super-Earths have the right, extremely dense atmosphere."